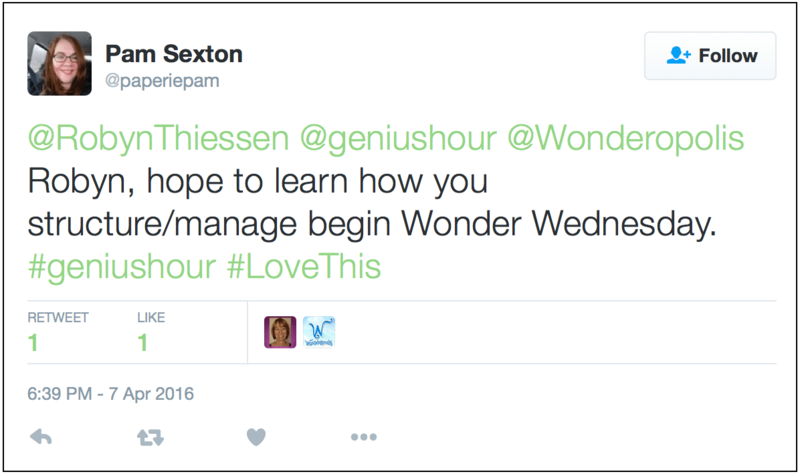 Our latest #geniushour chat was on Thursday, April 7, 2016. The topic was Genius Hour in the Primary Classroom, grades K-3. We enjoyed the leadership of two primary teachers who rock Genius Hour with their students: Robyn Thiessen, grade 3 teacher from British Columbia, and Renee White, first grade teacher from North Carolina. A summary of a great chat! 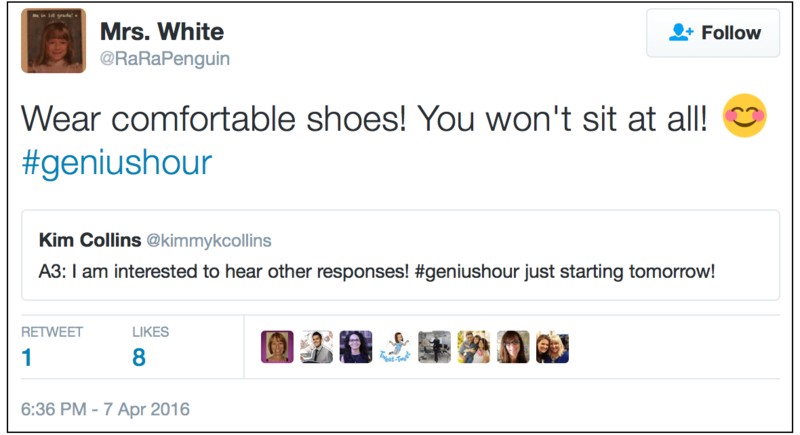 This summary of the tweet chat will give you lots of ideas straight from of the classroom on how to do Genius Hour with our youngest learners. Q1: How do you introduce the concept of #geniushour to your little geniuses? Michelle added that you can teach the difference between wonders that are researchable and those which are simple to figure out. Renee shared her Question Matrix based on Bloom’s Taxonomy to help teach questioning. 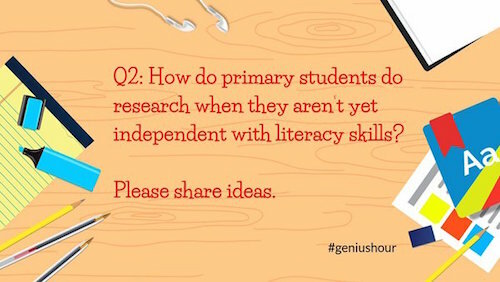 Q2: How do primary students do #geniushour research when they aren’t yet independent with literacy skills? Share ideas. Angela had also used PebbleGo and loved it, but expressed concern about the limited number of topics. Robyn and Renee, the moderators, also helped some of us know it was OK to not focus on research, but to let students create. 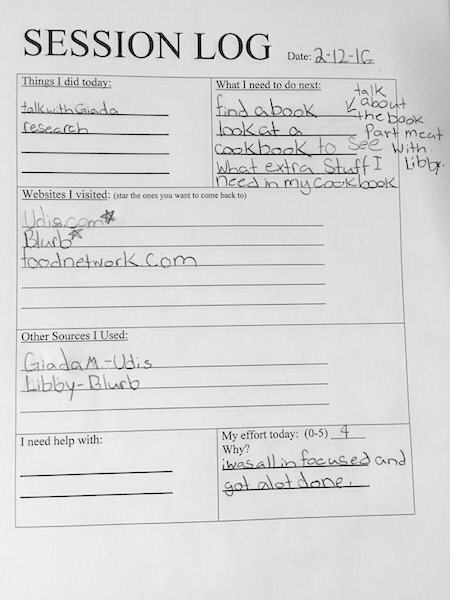 Robyn said regarding what Genius Hour looked like in her room, “Many of my students choose to create, make and tinker.” “Some will need to explore with their hands and minds first before running into need for research,” said Renee. And Robyn added, “For me it is the student’s time, if I tell them they have to research then I am limiting their creativity.” We are so happy that they brought this up and we advocate for this creative freedom in our book as well. Q3: How do you manage all of the #geniushour projects of your little learners? And lots of us want to hear more about this, Robyn. Might there be a blog post about Wonder Wednesday in our future? Q4: Do you collaborate with and/or have mentors in other grades/classes for #geniushour? How does this benefit your young geniuses? Some of us had to say, “Not yet” to this question, but we’re hopeful. Q5: What does #GeniusHour look like in your room? For example many of my students choose to create, make and tinker…..
My students use @Seesaw with pics, video, and voice to reflect during and after Genius Hour. Jill, teacher librarian, from New Hampshire, asked if anyone would like to Skype with students about Genius Hour. Can anyone help Jessica answer this question? Popplet and MindMup were two that were mentioned. Any others? Renee White, our co-moderator, introduced me to a resource that was new to me: Buncee.com There is an educational account. She used Buncee to create the graphics for her chat questions, like the one at the top of this post! Angela Gadtke shared that she was inspired by Gallit’s ISTE2015 presentation. She will present at ISTE2016 about Kindergarteners in Genius Hour. Robyn and Jessica will be there too. I hope you will all share pictures and tell us how it goes! Robyn, Molly, Renee, Pam, Jessica and Angela all talked about connecting with one or another after the chat. You can connect too. Add new members to your PLN. Join others in connecting about Genius Hour for primary students! You can also share with the hashtag #PrimaryGH, which is not as busy as the #geniushour hashtag. Together we are smarter! Now, we’ll end with a couple of our favorite tweets from this primary chat. True for all ages! We hope you enjoy Genius Hour, a rich learning experience for you and your students! Please, do leave a comment and join us here in talking about Genius Hour. We’re listening!